Mac OS X based systems access this tool through Network Utilities or by using the terminal to send a traceroute command. Windows provides this tool through the command line with the command tracert. Most Linux-based distributions use the traceroute or the similar tracepath tool to provide you with this information. If you don't want to bother with going through the operating system tools, or if you aren't sure how to navigate a command line or terminal, web-based traceroute tests are available. For example, WebSitePulse offers a website test through its site. This test performs a traceroute test and shows you every hop that a particular data packet takes to try to reach its destination. No matter where you access this test from, the exact process the computer performs during a traceroute is identical. 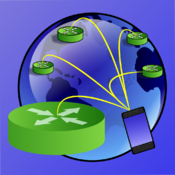 It creates a number of ICMP echo request packets sent to a specific host or IP address. These packets are sent to the host by a path determined by the router, with alternative hops used if a particular connection times out. You receive specific information on the routers that the data has been sent through, as well as how long it takes for the data to go through. This measure of time is denoted with a response time value. Traceroute tools which use TCP or UDP packets instead of ICMP for their testing are also available. Note that the route that the packets take may vary every time you try to access a specific host. The routers look for the most efficient path, which may change over time or during different times of the day due to network traffic. If you identify a problem with the particular route that the data takes, you have a few options on how to fix it. Sometimes entire networks go down temporarily, which makes it difficult to reach a particular portion of the web. Other times the issue is just with the path, and retrying the connection fixes the problem. You can use this information to figure out whether a host is fully down or if the path was taking you through connections that were not currently working. No matter what specific need you have for it, a traceroute test is a convenient tool to have when you're running into network problems. Whether you're an end user or a network admin, chances are you're going to be using this tool quite often. Traceroute testing has a number of parameters you can adjust to fine-tune the diagnostic usefulness of it. You can change the packet types to deal with firewalls, use additional protocols, modify the wait-time per hop to see if increasing the timeout time will create a successful connection, and other features. This tool helps to fix bad routing tables and high ping. Even if you don't think you're ever going to use a traceroute test, it's good to know that it's handy if you need it. It’s best to the web-based kind, and since it’s not platform-specific, it means you can bring it up on any operating system you want. Now, try out the traceroute test tool yourself.